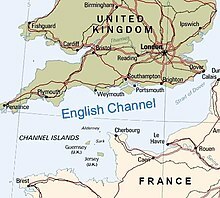 The English Channel (French: la Manche) is a shallow sea that links the southern part of the North Sea to the Atlantic Ocean. It separates United Kingdom (England) and France and surrounds the Channel Islands. Crossing the English Channel is possible on a number of UK south coast ferry routes, or under though the Eurotunnel. This travel guide page was last edited at 08:25, on 29 April 2018 by Wikivoyage user Traveler100.